Max, a puppy, is off to the shops with his Mummy to buy a birthday present for Max’s Daddy. Max is full of bright ideas, but Mummy just wants to buy boring old flea powder. She won’t listen when he asks to go to the toy department. Max creates havoc at the beautician’s, then gets so bored while Mummy is looking at men’s jackets that he sneaks off to find the toys. There he has a whale of a time. Having played with all the toys, Max decides that Daddy would like a skateboard best. Suddenly, however, he realises he is lost; fortunately Mummy is looking everywhere for him. She eventually finds him amongst the toys and is so relieved that she agrees to buy the skateboard. They drive off home in a car laden with gifts. The story ends with the whole family enjoying a birthday picnic in the countryside, where Daddy is obviously enjoying the skateboard much more than the flea powder. 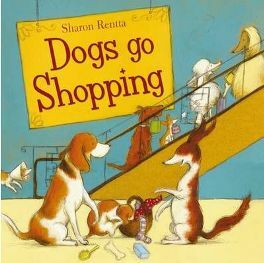 Sharon Rentta has created a delightful picture book in ‘Dogs Go Shopping‘. Its pages are chock full of action, fun and humour. At the same time, there is of course the underlying message that if a child goes wandering off alone they might not be able to find their way back to their parents. It’s a warning for parents, too, not to get so caught up in what they are thinking about that they don’t notice their child has got bored and gone to find some amusement elsewhere. The text of the main story is kept to a minimum on each page and is usually superimposed on a light-coloured area of the illustration. The font is large and clear. Apart from this text, however, there are numerous little phrases set in a small font in a hand-written style beside the dogs, showing snippets of conversation. Sometimes these are no more than onomatopoeic expressions such as ‘Boing! boing!’ ‘Whee!’ or ‘Twang!’ to show how much fun Max is having with the toys. An adult reading aloud to a young child who has a short attention span could easily leave out these phrases and just concentrate on the main text. On the other hand, a young independent reader would be bound to find some of them amusing, and they do add interest. Sharon Rentta illustrates her picture books herself, and here she has really gone to town with various different breeds of dogs and their shopping antics. There is just one Siamese cat at the beginning, whom Max and Mummy are saying goodbye to at home. After that it is dogs, dogs, dogs, with not a human in sight – but is that a cat on the escalator as well? Some form an orderly queue at the till, others go up and down escalators, and the puppies bounce on a trampoline and go for a ride in a toy train. Colours are soft green, light brown, cream and perhaps light blue – never garish, but certainly not dull either. There is so much fun and expressions are usually so happy and friendly that colours can easily remain subtle rather than grabbing too much attention. ‘Dogs Go Shopping‘ is definitely an ideal book for any family of dog lovers, but the fun that Max has trying out all the toys will appeal to almost any young child. Children are also more than likely to enjoy the way Max gets caught up in the cables and causes havoc at the hairdressing salon. I did feel that the story meandered a little when Max and Mummy were drifting from one department to another, but it picks up again when Max realises he is lost. For a child who loves to linger over details in a picture book, this is the perfect one, especially with the bits and pieces of doggy conversation to read. Then again, those could be omitted completely without losing the basic story. I read it to a small group of three- to four-year-olds, and at the end they said how much they had enjoyed it before I even had chance to ask them. ‘Dogs Go Shopping’ may not be the cheapest of picture books, but it would make a great present for a child who loves dogs. No Comments on "Dogs Go Shopping"